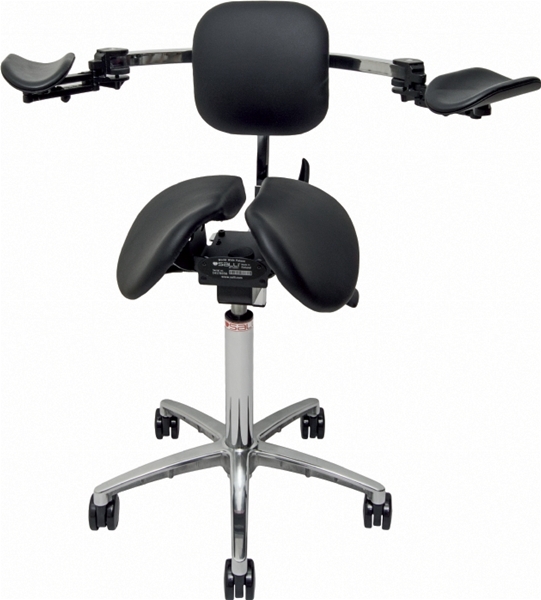 The Salli Saddle Chair with an ErgoRest linear tracking arm provides effortless, unrestricted motion and full support. Dedicated computer keyboard input tasks. Rehabilitation aid for shoulder patients. We do not recommend this arm for precision hand work. For precision work please see the Salli Elbow Rest. 5-1/4" stepless height adjustment adjusts with a simple thumbscrew. Arms swing 360° and extend laterally 9¾" on roller and thrust bearing connections. Stable and easy-to-use. Comfortable forearm pads are upholstered in easy-care soft leather. Note! In 20 years we have never seen a failure of the mechanism. However, the pads do wear and can be replaced when necessary. Made in Finland of strong, light-weight die cast aluminium alloy and polyamid. 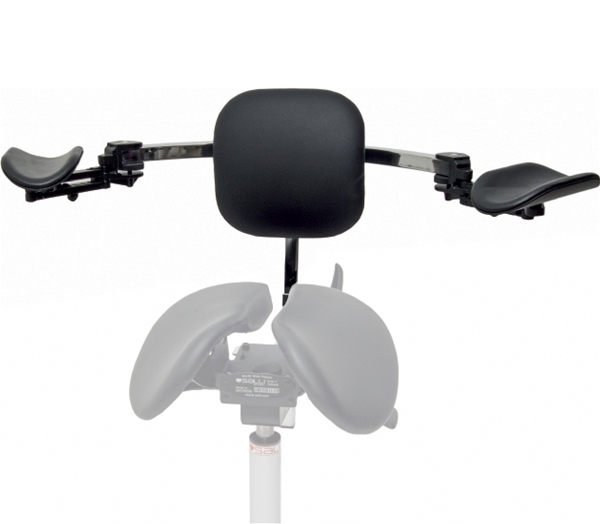 Attachment bracket under the seat is height and fore-aft adjustable and removable. Compatible with most Salli Classic, Twin and Multiadjuster models. 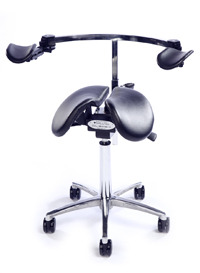 Please Contact Us to confirm compatabilty with a previously purchased Salli Saddle Chair. Five (5) years for Salli chair components, including the seat, casters, tilt mechanism, lift, and base. Two (2) years for Salli chair accessories. Extended Warranty: Free additional five (5) years when you register your premium Salli chair on the Salli website upon purchase and complete a feedback questionnaire after 6 months of use. Animals or any other inappropriate use. See the Salli Instruction Manual for complete warranty information. In-stock items ship in 3-5 business days. Back Orders and Special Orders have longer lead times. There is no additional charge for Back Orders and Special Orders, but delivery time can be 3 - 8 weeks. Customs and import fees are additional.